Nothing in this article is to be construed as investment advice. Neither the author nor the publication assumes any responsibility or liability for any investments, profits, or losses you may incur as a result of this information. Binance Coin stands out as the biggest winner among the top 20 cryptocurrencies today, as investors flock to secure their gains in this unofficial ‘stablecoin’ against the current falling BTC market. While figures on the Coinmarketcap listing look promising, the BNB/BTC trading chart is showing some worrying signs that maybe not everything is as ‘stable’ as it looks. 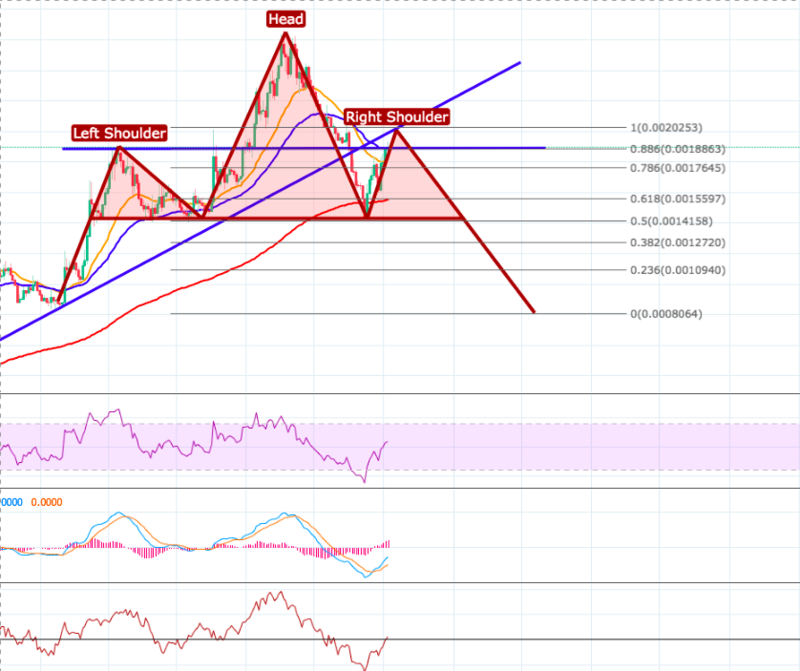 Looking at the 1D BNB/BTC chart you can see a very strong bearish head and shoulders (H&S) pattern setting up, following the recent bearish episode that broke through BNB’s long-standing diagonal support level. H&S patterns are characterised by a neckline that acts as a base support for the pattern, a left and right shoulder that typically peaks around the same height, and the head that sits in the middle of the shoulders and represents the strongest uptrend in the pattern. Using these guidelines, we can see that the neckline for this particular example sits at the 0.5 fib level, with the current price action looking to complete the right shoulder. Candles are already struggling against strong selling pressure as they approach the left shoulders peak price point at 19,000 Sats. The pattern will be confirmed or rejected depending on how the price action performs at this area. If it fails to test this area, the H&S pattern will be confirmed. If it surpasses this area, the pattern will fail. So if BNB is the top gainer in the market right now, how could it possibly turn bearish? If you look at the market right now, Bitcoin is now correcting after enjoying a 35% price surge during its peak performance over the last month, when it climbed from $6,169 to $8,383. This means that investors are hurriedly trying to secure their gains in other stable coins and pegged-value assets like Tether (USDT) and Binance Coin (BNB) right now, ready to reinvest back into the market when it begins recovering. When Bitcoin corrects after making a strong run, the market anticipates alt-coins to run next in the cycle because these typically make bigger gains during market recoveries. This is because alt-coins are much cheaper than Bitcoin, so when money returns to the market alt-coins stand to offer bigger returns to investors. Binance Coin in its current state, is used to hedge a falling Bitcoin market which is clear to see in the current market. When alt-coins begin to run, however, market sentiment will become bullish and investors will start to re-distribute funds from stablecoins back into the altcoin market. Demand will therefore fall for BNB, causing the price to decline until the market turns bearish again. In summary, if alt-coins begin to surge over next week it’s very likely that we’ll see BNB’s price action complete the right shoulder of this bearish pattern, as investors reallocate positions in accordance with the moving market. How likely is it that this pattern will fail? Looking at the charts indicators over 1hr candles we can see some conflicting signals that suggest bullish traders are gaining the upper hand right now and look determined to reject this pattern. MACD is high above the signal line and the faster moving average is still holding well above the slower moving average. The asset is just recovering from being overbought on the RSI indicator. CMF is consolidating sideways above the zero line, showing neither a positive nor a negative trend. 25/50 EMA lines are still bullishly separated. All price targets are set from the 0.886 fib level/ 19,371 Sats mark. 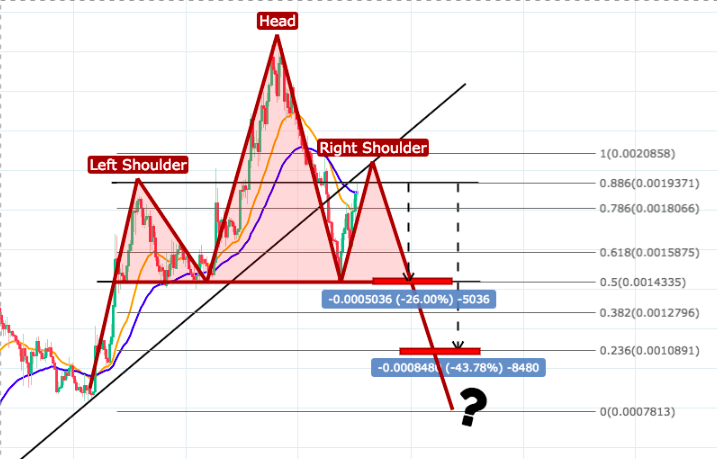 The price targets for this asset are set on the assumption that the asset will fail to break clear over the 19,000 sats mark and complete this H&S pattern. **If the asset breaks bullish from the 0.886 fib level, expect the 1.0 fib level at 20,858 Sats mark to be the first target.